A Shepard’s diagram typically describes the composition of soil in terms of three materials: clay, silt, and sand. The pyramid labels each portion according to the respective proportions of those materials in a particular clump of soil. 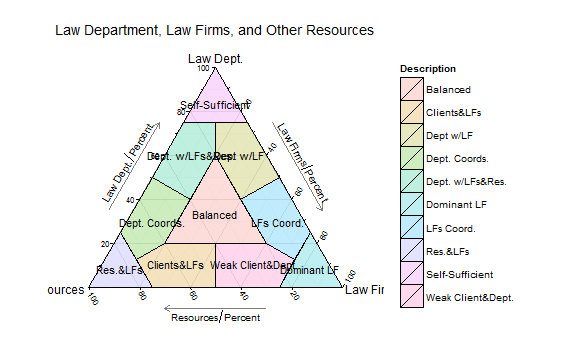 Naturally, seeing such a diagram led me to think about law departments. My notion was that a company has three basic sources of legal guidance: its internal law department (if there is one), the law firms or private lawyers it hires, and the clients, consultants, outsource services and others who help identify, prevent, or deal with legal issues. In the diagram I call that third group, collectively, “resources”. So, here is the Shepard’s diagram of the three legal services. Each side ranges from a low percentage of reliance on that service to a high percentage. So, for example, the top component represents a company where the law department does everything, there are no outside counsel, and the “resources” are mid-way. I tried to label the components that result in a short way, but realize that the labels can be improved. Mostly, this diagram allows you to represent numbers tied into the relative contributions of law department service providers. This is good way of visualizing a prudent organization structure for a law firm. Never really saw it this way. Thanks Rees.